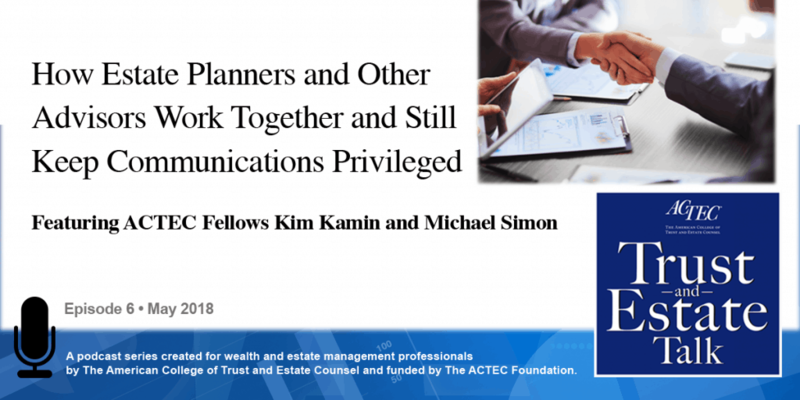 “How Estate Planners and Other Advisors Work Together and Still Keep Communications Privileged.” That’s the subject on this ACTEC Trust and Estate podcast. This is Susan Snyder, ACTEC fellow from Chicago. Estate planners are often asked include other advisors in conversations about estate and tax planning. To learn more about attorney-client privilege issues in this area, we will hear today from ACTEC Fellows Kim Kamin of Chicago and Michael Simon of West Palm Beach, Florida. Welcome Kim and Mike. Thank you, Susan. In many ways, today estate planning is a team sport. Attorneys, along with a team of other advisors, work together to serve clients. But there can be a tension between the goal of protecting attorney-client privilege and true collaboration and free-flow of information. So this begs the question of what can be done. Mike, are there any ways to protect client communications? Sure, there’s ways of protecting the information and communications exchanged in that collaborative effort from disclosure to third parties. Well, there’s five ways that are most common: you can have the attorney-client privilege, you can have a work-product privilege (which is more of a doctrine than a privilege), the accountant-client privilege, HIPAA (which is a federal law that protects the confidentiality of medical records), and many states have a psychotherapist-patient privilege. So do any of those come up more than others? It does, really. Attorney-client privilege is the most common. If you are an advisor or a lawyer and you’re sitting with your client and there are other advisors, and you hear somebody talking about–the client’s talking about a conversation with their son’s psychiatrist or they’re talking about medical records–you ought to just know that that has some confidentiality attached to it. But the primary way that these disclosures or these communications are protected from disclosure is by the attorney-client privilege. So, we all studied the attorney-client privilege back in law school, but can you remind us how it works? Attorney-client privilege is really kind of counter to the way the courts view the process of a free-flow of information, so it’s kind of strictly construed. The elements of attorney-client privilege are it’s got to be a communication between a lawyer and a client, it’s got to be in the course of the legal relationship and for the purpose of either giving or obtaining legal advice, and there has to be the intention by the client that that communication be confidential. So then is everything that’s said between the attorney and the client privileged? No, and that’s a good point, some people think it is. Handing a lawyer a document does not make it confidential. That’s important to know. The way that the attorney-client privilege works (it’s two ways that blow the privilege or lose the effect of the confidentiality portion of it) –is that: 1) you make those statements in front of third parties or other people, or 2) you’re talking about things that have nothing to do with your representation. So then how does having a third party involved impact that? So when lawyers are collaborating with these other advisors to serve clients together, what is the way they can protect it from disclosure? They’ve got to make sure they can follow then a couple of limited exceptions that the courts have applied to third parties. And the most common of those is there’s an agency theory. You’re an agent of the client, so the third party can say, “I’m an agent of the client.” The next most common way is what the courts refer to as someone being a translator. That that person is necessary to assist the client or the lawyer by translating information. That could be literal, like another language – the client speaks Spanish, the lawyer speaks English – or, it could be something like, you’re talking about a complicated tax concept that the lawyer needs some help with. And, finally, when you look at what are the other exceptions, is you can be a facilitator. And when you’re a facilitator that means you can help the lawyer or the client render the advice or receive the advice. A lawyer’s secretary, for example, would be included in there. Or sometimes even a son or a daughter can help an elderly parent who has a bit of a memory issue and remind them, “Hey Mom, you remember that you bought this or did that.” So that’s the most common ways these are protected. So, with that in mind then, do you have any suggestions for how advisors and attorneys can work together to best protect the privilege? Sure, I think you have a duty to try to protect the client’s privilege. And there’s a process you can apply. So if you’re either the lawyer or even one of the advisors you can say, “Well, when I walk in a room – either literally or figuratively – if you’re on the phone–and you’re the lawyer and there’s someone else there other than your client, you need to ask the first question, “Who are you, and why are you here?” That a good place to start. If that person says, “I’m here because I’m the accountant.” The next question is, “What’s the purpose of you being here?” If you can’t put them in one of those categories where they’re either an agent, a translator, or a facilitator, there’s some risk that that communication’s not going to be protected. And also, you need to ask the question if you’re not the lawyer and you’re not the client, you’re the advisor, for example, you need to ask the question, “Why am I here? Do I need to be here?” Sometimes the client wants you there, but are you really necessary? Are you adding to the conversation? Are you facilitating the rendition of legal services? If you’re not, maybe it’s time to leave the room. So that could be an important thing. And thank you Kim and Mike for helping us protect attorney-client privilege.